Straight from the minds of design - let our interior designers from Jasmin Reese Interiors show you just how versatile yellow can be. April has come and gone, but this color of the month can have a lasting effect. Yellow, the most cheerful color in the spectrum, oftentimes gets overlooked as too bright, too bold or too blah in favor or reds or blues. But the color has its merits - just ask the pros. Don’t just limit your pops of yellow to bathrooms and kitchens when planning your interior paint colors - there are many shades and many ways to incorporate the tone beautifully into your home and garden. 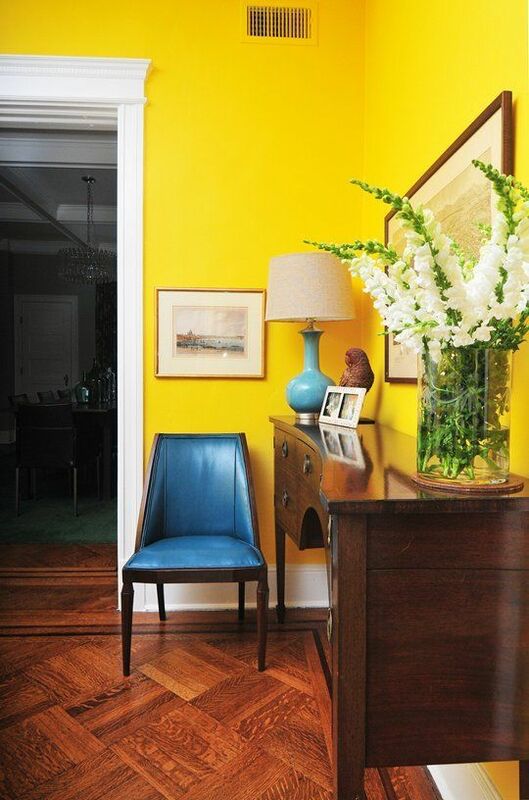 “Whether you decide to paint an entire wall or add a brilliant pop of color like a door, yellow always delivers vibrancy and energy to a space,” notes Reese, mentioning two favorite shades - Confident Yellow from Sherwin Williams, and Sun Kissed Yellow from Benjamin Moore. Don’t just think paint! Decor can spice up your interiors as well, and considering pieces featuring yellow can add zest without overwhelming the space. Consider, for example, Reese’s suggestion: this “Citrus Garden” print by Schumacher. It features muted mustard tones, and was created as part of their 125th anniversary fabric collection. Already ahead of the game? How are you using yellow to add vibrancy to your space? Call us today for a free color consultation with Jasmin Reese or to get started with your yellow interior painting project.